Almost every artist agrees that it’s easy to begin a work of art but it’s much harder to give it a good finish. When looking at Chaplin’s career, the same tendency can be seen. The final scenes of his movies were often reshot, reimagined and reconstructed, marked by drastic changes and sudden decisions. This time, I’m going to have a closer look at five of his films where the endings we know of today might not be the ones originally intended. We would like to turn your attention towards the authorized picture database and YouTube channel of the Chaplin Office where you can access a huge amount of Chaplin-related material. If you’re in need of something you can’t find at any of these addresses, you’re always welcome to contact the Chaplin Office via Facebook or per e-mail. On top of that, they have offered to post the entries they find outstanding on their own blog at the official Charlie Chaplin website. Sir Charles Spencer Chaplin, also known as Charlie or The Little Tramp, was born 129 years ago, on the 16th of April, 1889. 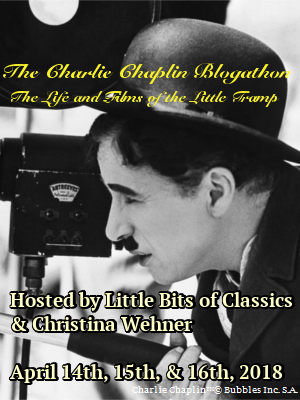 Seeing this as an opportunity to celebrate together, Christina Wehner and I have decided to host a blogathon in his honour between the 14th and 16th of April. The following classic movie actors have a special place in my heart because of their ability to make me feel good whenever they appear on the screen. As the national classic movie day has arrived again, I decided to to pay them back some of the happy moments they caused me by listing the things that used to make them happy. Prepare yourselves for some interesting facts about my all-time favourite movie stars! Charlie Chaplin and Buster Keaton are the two most prominent figures of early movie comedies and they are often mentioned together as rivals for the “best silent comedian” post. Their relationship is an often-discussed topic and there are several theories floating around. Did they really feel threatened by each other? Or were they friends in reality as some others claim? There’s only one way to discover what is probably the closest to truth. Let’s take a look at this extraordinary relationship with the eyes of those who knew them. It’s taken me quite some time to finally come around writing this post. Lots of things happened since my visit to Chaplin’s World but it was an experience hard to forget. This newly opened museum is a unique place for every Chaplin fan which we all want to visit some day. I was lucky enough to spend a day in Vevey this July. What I saw, amazed me greatly and I came home with lovely memories that I’m happy to share – even if I’m half a year late!